Use your SNAP card at market to purchase the most nutritious local food available. The USDA approved the use of SNAP/EBT at farmers markets across America to provide access to the most nutritious locally grown food. In addition to families in need having access to locally grown food the producers are also beneficiaries of the program keeping economic opportunities in the local community. See below how the Walmart Foundation supports incentive dollars for SNAP participants to shop at local farmers markets. Swipe your EBT card for your amount determined (maximum transaction amount varies $20) and receive dollar for dollar matching. 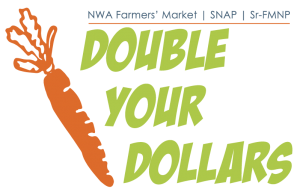 Also the Double Your Dollar Grant Program sponsored by Walmart Foundation, The Jones Center, and University of Arkansas offers the funding to match Senior Farmers’ Market Nutrition Vouchers. SFMNP – The Senior Farmers’ Market Nutrition Program (SFMNP) awards grants to States, U.S. Territories, and federally recognized Indian tribal governments to provide low-income seniors with coupons that can be exchanged for eligible foods (fruits, vegetables, honey, and fresh-cut herbs) at farmers’ markets, roadside stands, and community-supported agriculture programs. If you are interested in applying for SFMNP vouchers, please contact the Area Agency on Aging. (click on link to visit website) or call (870) 741-1144 or (800) 432-9721. SFMNP vouchers will be matched with DYD funds up to $25.00 for seniors while funding is available at the manager’s booth. FOR ADDITIONAL INFORMATION AND ALL MATCHING INCENTIVE PROGRAMS PLEASE VISIT THE MANAGER’S BOOTH AT MARKET.